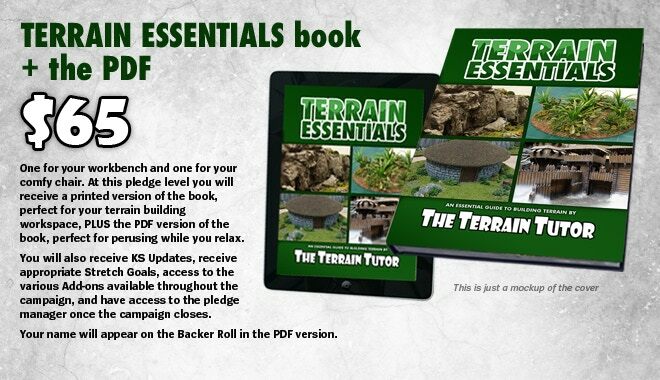 This Kickstarter campaign is to fund a printed version of the book – TERRAIN ESSENTIALS – a 96+ page book perfect to add to the collection of anyone with an interest in creating excellent tabletop terrain, regardless of purpose or the builder’s ability. 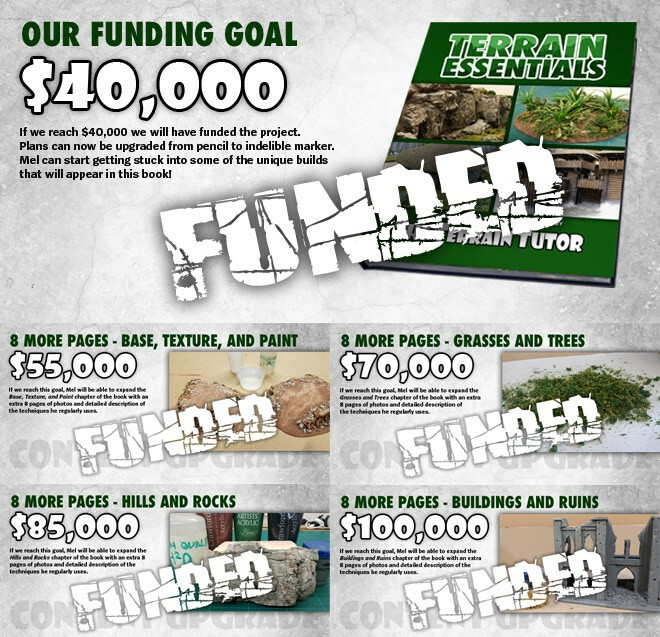 In addition to Mel’s YouTube channel and regular livestreams, Mel and Dave have been talking to various media outlets about Terrain Essentials (and Dave’s book – Armies & Legions & Hordes). To see Mel on Beasts of War, click HERE. To see Mel at Salute on Beasts of War, click HERE. To see Mel and Dave on Guerrilla Miniature Games, click HERE. To see Mel and Dave on Skirmish Supremacy, click HERE. To see Mel at AdeptiCon with The Lady in the Dress, click HERE. To see Dave at AdeptiCon with The Lady in the Dress, click HERE. To hear Mel and Dave on Rememberancer’s Retreat, click HERE. To hear Dave on The Brush Wielders Union, click HERE. To hear Dave on The Independent Characters, click HERE. To hear Dave on 40K Radio, click HERE. To hear Dave on the Cast Dice podcast, click HERE. Theory – From inspiration and research to planning and set design, from colour theory and build types to workflow and longterm project management, this section will help you plan the best terrain for you before you even start building. Materials & Tools – Covering all the most commonly used materials, from basic craft and DIY to specialist modeling materials – including how and where to use them in terrain making – along with an in-depth guide to the essential simple, professional, and custom tools specific to making terrain, this section is all about making sure you have the right tool and right material for the job! 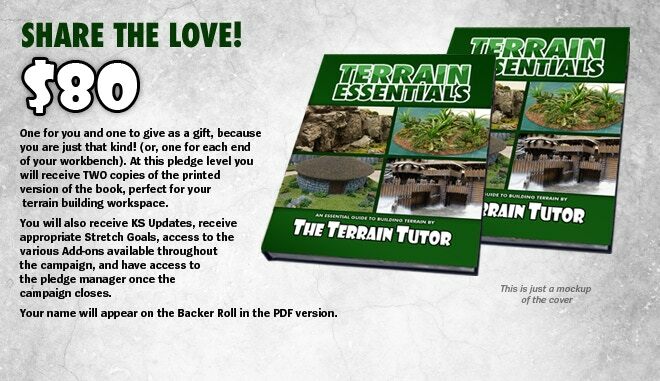 Core Techniques – From cutting bases to sealing your finished terrain and a whole host of techniques in-between, this section will ensure you have a solid understanding of the core skills and techniques used across the spectrum of terrain building. Covering the essentials, from basics like cutting and gluing, to advanced washes, sealing techniques and combating warping, this section will not only give you the information and confidence to use these techniques but also troubleshoot them. Base, Texture, and Paint – Good terrain starts with a good foundation and this section provides in-depth coverage of basing, laying down the ground, realistic texturing techniques, and a range of earth tone painting guides. From cheap and easy basing materials to perfect pigments, you will have the information you need to make sure all of your projects start with a solid, realistic foundation. Grasses and Trees – This section is all about the greenery, from laying down beautiful and durable grasslands and pastures, to tufts, flowers, shrubs, bushes and hedgerows. As well as tackling the small stuff, this section will go into creating a range of trees; everything from armatures, to bark textures, painting and finally creating awesome looking foliage for your trees. Hills and Rocks – As the most common feature on gaming tables, this section covers those rocks, slopes, hills, and cliffs. We look at everything from a number of different construction techniques to maximising playability without sacrificing realism, realistic painting guides, and more advanced techniques for modular and large feature hills and cliffs. Buildings and Ruins – Buildings and ruins can be mini-projects in their own right, so this section breaks it all down and takes you step-by-step through building, painting and fine detailing for buildings from our history, or a dystopian, gothic, far-flung future. Covering multiple techniques for everything from the foundations to the roofs, this section will have you making the best buildings for your urban combat. Water and Snow – Often seen as the more challenging aspects of terrain making, this section will demystify water and snow pieces, giving you a range of techniques, core colour theory, and guides to the most common pieces like ponds, modular rivers, and snowy terrain. Terrain Kits – As MDF/HDF kits, cardboard kits (eg. Battle Systems terrain – battlesystems.co.uk), 3D-prints, and resin casts become more prevalent in tabletop gaming, this section not only equips you with the key knowledge to make putting your kit together problem free. But it’s not only about building kits; we will also take you through customising and tying your kits to your existing terrain collection, giving you what you need to turn each kit into a unique terrain piece. Mel’s Top Tips – Throughout the previous sections, Mel will be giving his top tips, tricks and fixes, making sure you learn from his mistakes so your builds go as smoothly as possible. We are planning to cover each of these chapters in as much detail as possible, to give you as much information as we can. 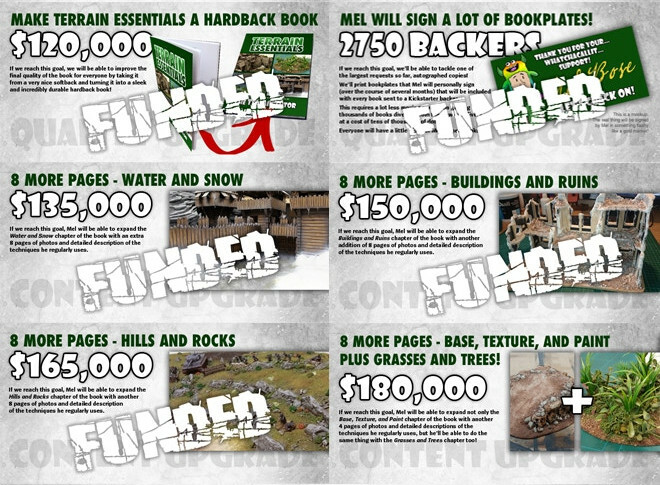 We have a number of stretch goals planned that will help us provide more in-depth knowledge on each of the techniques used and sample builds shown in the book. 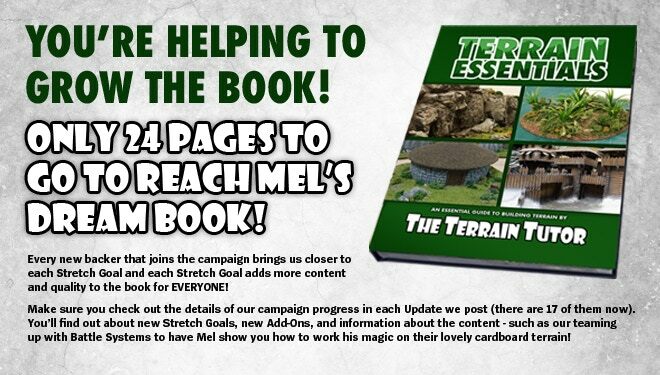 It has been quite a while since there was a great “Introduction to Terrain Building” type of book on the market, so after five years of helping the community build their terrain on Youtube, it seemed right for Mel to be the one to do it. On The Terrain Tutor YouTube channel, Mel presents a lot of great ideas, techniques, materials, and tools in a handy, episodic fashion, but we know that not everyone learns in the same way. The written word (particularly when accompanied by great photographs) can help many terrain builders connect with the material covered in Mel’s videos. Helping others enjoy their hobby is one of the key drivers behind The Terrain Tutor, and Mel finds there’s certainly a lot of job satisfaction when helping others be happy is your living. Mel is partnering with Dave Taylor, of Dave Taylor Miniatures, to bring this book to life. Dave has been involved in tabletop miniatures wargaming for almost 30 years, has worked in „the business“ for 25 years, and has known Mel for a decade. 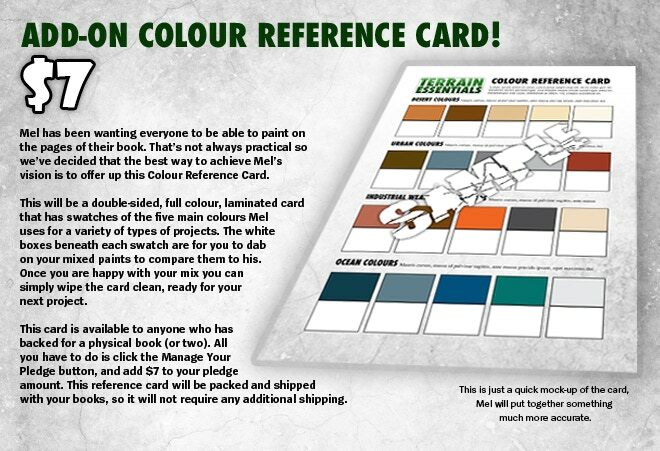 Dave recently delivered his own book aimed at helping wargamers complete more of their wargaming projects more often – Armies & Legions & Hordes – which he successfully funded here on Kickstarter last year. 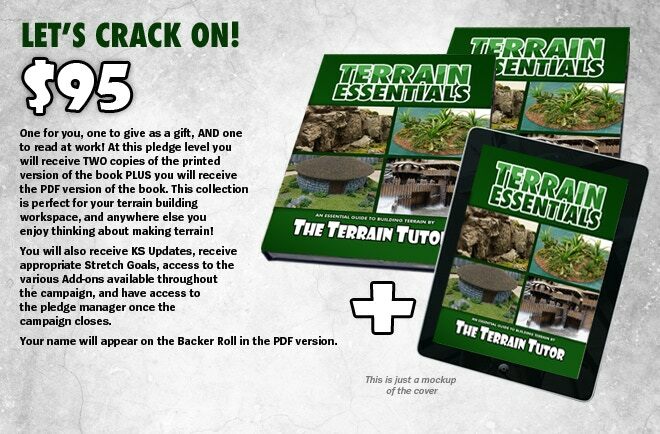 Dave is running this campaign, and will be coordinating the layout, editing, publishing, and distribution of TERRAIN ESSENTIALS. If you would like to see flip-throughs of Dave’s book, you can check out Guerrilla Miniature Games HERE, and Tiny Plastic Spacemen HERE. Of course, this campaign is also a bit of an experiment. If things go well, we may look into a series of more detailed books for a future campaigns. Die Kampagne endet schon in wenigen Tagen und ist (wie zu erwarten war) voll finanziert. Das Buch ist ja ganz nett, aber mit Versand viel zu teuer. Das ist das Leiden von kleineren (Fach-)Auflagen mit vielen Fotos.Das geht schnell ins Geld beim Druck. Dann kann man zu $45.00 nichts sagen, wenn man es mal mit anderen Bildbänden vergleicht. Die Videos vom Terrain Tutor gefallen mir, da ist das Buch auch interessant für mich.
12$ für ein Buch dieser Größe zu teuer?! Schon mal versucht FFG was zu bestellen?! Sind in Summe 57$ und das ist mir zu teuer. Mag sein daß man mittlerweile die 100€ Codizies von GW als normal entfindet. 50 € inklusive Versand für einen aktuell 160 Seiten gebundenen Tutorial-Wälzer? Das ist meiner Meinung nach durchaus gerechtfertigt. Zwar nichts, was ich mir aktuell über Kickstarter kaufen werde, aber sicherlich etwas zum Schmökern, was ich mir gerne zum Geburtstag oder zu Weihnachten wünschen werde 😀 Ich freue mich jedenfalls, dass der KS so gut gelaufen ist und hoffe, die veröffentlichte Ausgabe wird in einem ähnlichen preislichen Rahmen liegen! Stimmt, aber da wäre mir tatsächlich das Terrain Buch lieber, als diese limitierten Codizies. Aber der Erfolg gibt beiden Recht. Das wäre mal wirklich ein KS, wo ich mal „nur“ den pdf-pledge wählen würde. Den Mehrwert von einem (an sich coolem) Buch ist der Aufpreis mit Shipping nicht wert. Tolles Projekt, wie ich finde. Auch ist es in meinen Augen angemesen bepreist (ja, auch mit Versand). Der Mehrwert ist in meinen Augen wesentlich höher als bei manch anderem hobbybezogenem Buch und in Anbetracht der Tatsache, das gerademal zwei Leute daran arbeiten völlig okay. Ich betriebe viel Geländebau und Mel the terrain tutor hat mir viel in seinen Videos gezeigt. Da unser Hobby eher analog ist kommt für ich mich nur das Buch in gedruckter Form in Frage. PDF ist da keine Option. Zum Thema Kosten: Mel macht da Buch und bietet es zu dem. Preis an. Ob er dabei nicht den günstigsten Weg geht ist mir egal. Der kickstarter ist auch dazu da seed money zu generieren für ein neues Projekt. Selbst wenn Mel 15-20k Euro Gewinn macht, dann erlaubt es ihm nicht in Saus und Braus zu leben oder gar nicht mehr arbeiten zu müssen. Daher ist es mir egal, ob er mir das Buch in Summe 15€ zu teuer a dreht. Wer nur mal reinlassen will kauft in der Regel auch solch ein Buch nicht. Was die Kosten angeht: Sprecht mal mit Studenten oder Doktoranden, was diese teilweise für Fachliteratur hinblättern müssen. Und das sind oft genug dröge Bleiwüsten und nicht mit top Gelände bebildert. 50€ sind gewiss kein Schnapper, aber eben halt auch keine moderne Wegelagerei. WObei ich auch jeden verstehe, wenn es ihm/ihr persönlich zu teuer ist. Aber daraus sollte man keine Schlüsse auf die Allgemeinheit ziehen. Absolut fairer Preis für das gelieferte, da kenn ich deutlich teurere Bücher mit weniger Inhalt. Ich bin da ja wirklich versucht einzusteigen aber da ich noch die alten GW Terrainbücher habe, entweder als Pdf oder Print, bin ich noch etwas unentschlossen. Ich habe gestern noch gezögert, habe es dann doch sein lassen. So toll ich Mels Videos finde und so sympathisch er mir auch ist, so muss ich doch auch auf meinen Geldbeutel achten. Und wenn ich dann vergleiche mit anderen Produkten auf dem Markt, wie etwa das AK Dioramas F.A.Q. dann finde ich für mich, bekomme ich da mehr für mein Geld.